Carl would say, in his own defense, that no reasonable man would have taken such an offer seriously. Carl did not, and he considered himself a reasonable man. He accepted only because he thought it was the opening to a bar joke or clever trick. Carl sat at his usual stool at The Winner’s Circle, glancing at his empty tumbler and bemoaning the cost of whiskey. He’d already spent more than he’d intended tonight, and this was not the first time either. Why, he wondered, does scotch have to be so damn expensive. “I can help you with that, sir,” said the man on the stool beside Carl. This gave Carl a start, as he had not been aware he was thinking aloud. The man looked worse off than even Carl. Where as Carl merely had the disheveled look of a man who has had too much too early in the week, this stranger had the ragged and tattered quality Carl had come to associate with beatniks. When Carl looked at him, the man had quickly put his hand in front of his mouth, as if embarrassed that he had just spoken. His eyes though, had the quality of a man desperate to show off a skill. This is what led Carl to suspect a bar bet was forthcoming. Again, the man seemed embarrassed or even cross with himself at having spoken. Carl suspected this man wanted very much to showcase his trick, but feared being mocked for it. Carl was not in a good mood for this sort of thing tonight, but he felt sorry for the man. The man’s eyes gleamed with delight, and his lips turned up in a manic smile (almost deranged). “Nothing to hear,” he said. Carl noticed, for the first time, that the stool one down the bar from the stranger had a book placed atop it. A large leather bound volume, and the man seemed to be stroking the massive tome as though it were a favorite pet. “Look at your glass,” the mans said softly. Carl did, and was given another start as, indeed, his glass was now full. Carl was at first astounded, though a moment later he thought he’d reasoned out the simple trick to it. The man had drawn Carl’s eye to the strange petting of the book, meanwhile a coconspirator (a fellow patron or the bartender) had surreptitiously refilled the tumbler. Carl looked about for a sign of the companion of the trick, but saw no one close enough to have done it. Even the bartender was far from Carl’s seat. “That is quite a trick, friend,” Carl remarked, examining his glass. At this point, Carl expected the man to propose another, more difficult trick, but this time for money. Bar etiquette frankly demanded as much, and it had not been unimpressive. Carl was eager to see more. Instead, the man tucked the massive book under his arm and hurried out of the bar. He went so quickly, and with such a look of shame on his face, that Carl feared he might have been pickpocketed. After assuring himself that his wallet was still in its proper place, Carl wondered if perhaps the man’s strangeness had been the nerves of an amatuer embarrassed to show off in public. Maybe the man was an aspiring magician with stage fright. If that’s the case, Carl reasoned, he’ll need to get himself over that if he’s ever going to perform. Carl brought his attention back to the glass. It was full of a familiar dark amber elixir, and Carl took an experimental sip. The liquid burned at the back of his throat as he swallowed, a wide grin came over his face. It wasn’t just good scotch, it was excellent scotch. The kind of scotch that men write poems about. He took another sip. It was damn fine scotch. Carl stayed at The Winner’s Circle late that night. Sipping his whiskey and listening to the radio and whatever conversations he could drop in on. It was past midnight when he said his goodbyes and stumbled to the door. He thought it was odd that he was stumbling already. He’d only had a few drinks and hadn’t ordered a new one after that stranger had bought him a round as part of his trick. Carl didn’t get this drunk from just a few glasses of whiskey. He was confident fresh air would be the cure for this. The fresh air didn’t seem to help though, and his head was spinning as he sought to orient himself out on the street. It was at least a minute (perhaps more, he couldn’t be sure) before he realized that the glass was still in his hand, and almost a minute more before he stopped to contemplate that fact. It was unusual for Carl to be so drunk as to forget he was holding something, more unusual that no one had stopped him from leaving with it in hand, but the most unusual thing of all was that the glass was still mostly full. In a brief moment of lucidity, Carl considered pouring it out, but then, thinking on it, it would be a shame to waste good scotch. He turned to go back to the bar and return the glass, and resolved to finish the drink on the way. He turned, and had another bout of spinning. Once recovered, he was relieved to see that he had not spilled his drink. He set off the way he had come, taking a sip every few steps. It was still the best drink he’d had in some time. Very soon, it seemed that the ground beneath him was dipping and swelling like the deck of a ship on rough seas. Each step had to be carefully undertaken, with slow, deliberate movements. He looked at the scotch, holding it close to his face and squinting through the blur that surrounded him. It seemed just as full as when he had begun walking back to the bar. That couldn’t be right, he told himself, I must be more than halfway there by now. He took another ship, and examined the whiskey again. There was no change. The liquid was at the same level in the glass as it had been before the sip. Carl wondered if he could be so drunk that he had completely imagined taking a sip just now. He didn’t think so, as he was sure he had tasted it just now. He had felt it go down his throat. He gave it another try. He was sure it was real this time, but the glass was just as full. Carl stood there on the sidewalk, staring aghast at the tumbler of whiskey four inches from his face. He knew this had to be impossible, and yet there it was. He couldn’t possibly be that drunk. He took another sip, and then another, giggling madly as each sip failed to reduce his supply. All the quality scotch he could ever want, and for free, it was just like the stranger had said. It was a dream come true. It was like magic. In the middle of a long drink from his neverending glass, Carl stumbled. He barely managed it but he did remain standing. Still, his balance was beginning to fail him, so Carl decided home was the best place to be now. He also decided that he had perhaps had enough scotch tonight. He managed to get himself turned around and began walking (stumbling) towards home again. No more than a few steps in though, he found the glass at his lips again, and felt the burn in his throat. He chuckled and renewed his resolved to not drink anymore tonight. As he kept walking though, he found himself reasoning that he was already drunk, so one more sip couldn’t possibly hurt. Once he justified a sip this way, he found it very easy to justify one more. When Carl finally fell, it occurred to him (even through the strangling haze around his mind) that he had essentially been drinking the whole time. He had to stop, he knew this. He needed to get home. He wondered how close he was. Was he even going the right way? Had he taken Warren or 5th St? Carl tried to stand, and failed, so he made at a half crawl towards the nearest street sign, which he could no longer read from any real distance. He was having trouble crawling even, and Carl suddenly realized this was because despite his fall, he was not only still holding the tumbler, but it was at his lips again. He didn’t want to drink. He wanted to set it aside, but instead his hand tilted and his throat opened. This time he didn’t take a sip, but a gulp. Carl was afraid. 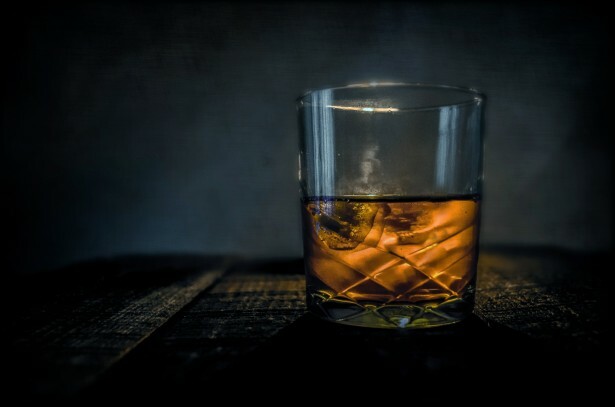 It is one thing to be drunk and make a decision while consciously aware that it is a bad one, but it is entirely another to make a decision and have your body pointedly disregard it. He managed to pull the glass away after a few terrifying gulps against his will. Carl wanted to drop the glass. He willed his fingers to open and let it slip out, but they remained tightly clasped around the horrible thing. He wanted to smash it against the pavement, or pour the contents out (for all the good it would have done as drinking had not diminished it). Somehow, even as he mustered the will to destroy or discard it, his hand moved of its own accord to bring the glass to his lips. Carl kept saying the words, even as the liquid began pouring into his mouth. He coughed and sputtered and choked and swore to himself: he wouldn’t drink it. They found him there in the morning. Carl Anderson, age 32, dead in a pool of vomit and spilled scotch. Just some drunk who didn’t know when he’d had enough, they thought. The police came and packed up the body, sending it off to the morgue until someone could claim it. One of the officers noticed the glass that the corpse was still holding, which despite having been spilled (as evidence by the scotch puddle at the scene) was still mostly full. He took the tumbler from the cold hand, examined it, and though he wasn’t sure why, he took a sip of the dead man’s drink. Damn, he thought, that’s good scotch. This entry was posted in Short Story and tagged 5th St Witching Hour, Fantasy, Horror, Short Story, The Book. Bookmark the permalink. I wonder how many alcoholics feel out of control like poor Carl here.